The world of professional boxing has historically been tainted by organized crime on many occasions. There are those who believe even when completely legitimate, the sport lends itself to same kind of conspiratorial greed and immorality that make up the mob. Writer Peter Blauner holds up these twin mirror reflections as the backdrop to his noir-like story of Anthony Russo, a struggling young man wanting to severe his ties to one of these worlds and escape into the other. By the time the tale spins itself to its inevitable conclusion, the realization that both are same in their cold-blooded ruthlessness is Anthony’s tragic epiphany. Living in Atlantic City, Anthony is married, has two kids and his wife, Carla, and is pregnant with a third. Anthony’s father, Michael, mysteriously disappeared when he was a child and his mother remarried Vincent Russo, the right-hand man of gang boss Teddy Morino. Although he loves his stepfather, Anthony wants no part of his Mafia brotherhood and this remains a point of contention between them. Add the fact that Carla is Morino’s niece and the friction between Anthony and mobsters continues to intensify. When his construction business begins to fail, he finds himself in debt to an aging, obese mobster. Afraid his life will imitate that of Vin’s, Anthony hatches a desperate scheme to become a fight promoter for a washed out ex-champ at the local casino. Envisioning a payout in millions, Anthony must learn the ins and outs of professional boxing while at the same time keeping Teddy and his cronies in the dark. When he learns his plan requires a great deal of cash before anyone will take him seriously, he goes to a loan shark and digs himself in deeper. There are palms to be greased at every step of the process, from crocked to commissioners to promoters and casino officials, all of them demanding a piece of the action. Anthony’s pot of gold at the end of his wishful rainbow begins to dwindle long before the actual fight is even scheduled. A man obsessed with changing his fate no matter the cost, a once beautiful showgirl willing to be used to save herself and her daughter, and a soulless, pathetic gangster dying of prostate cancer believing he is owed respect and tribute—these are only a few of the intense and complicated characters that Blauner lets loose in a setting that is all phony glitter disguising an underbelly of relentless despair. 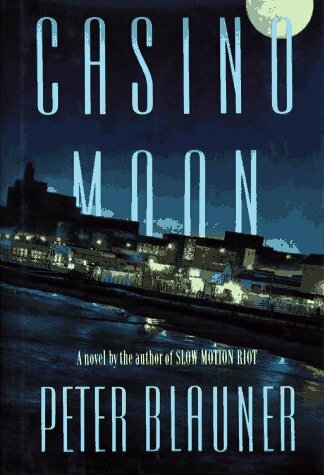 Casino Moon is a mesmerizing drama that will draw you in and hold you captive until the final bell, where the only winners are those smart enough not to bet against the house.